A Gesture or a Statement? We love to label and compartmentalize things. Fit them into a niche. Phillips Metal Works is home to an artist blacksmith, who produces ironwork that is called contemporary craft, utilitarian or public art. My industry endlessly argues over labels like craft and art, design and decorate, and feverishly vie to have their works align with the label that brings them closest to their goals. My approach to ironwork has been much less academic and a lot more scattered. I was intrigued by ironwork after watching an artist and friend in Tucson make some incredible work using any and all methods at his disposal. So I decided to give it a try. No formal training, no idea of the end product, just a fascination with the process and the endless possibilities. So over the last quarter century I have beat and banged out a wide assortment of ironwork. The direction of my work has generally followed whatever came along, from industrial to decorative, from drapery hardware to public sculpture. It has been fun and the lack of constricting labels have led me down a lot of ironworking avenues. When I started working with Ben Shoults at Base3 Creative on my new web site, it dawned on me that just throwing my hodgepodge of ironwork into a big basket may reflect what I do, but most people do not want to sift through 27 years of assorted ironworks to find the proper drapery ring for a ¾” pole. So I had to create some labels for my work and divide it up accordingly. My work seemed to best fit one of two self-descriptions. The first was the statement. This is work that would stand on its own. It is independent of its surroundings. The statement is a work that conveys an emotion or expresses a sense of welcome or adventure with maybe a little celebration thrown in. Many times this is found in sculptural pieces but can be found in any genre of my ironwork. 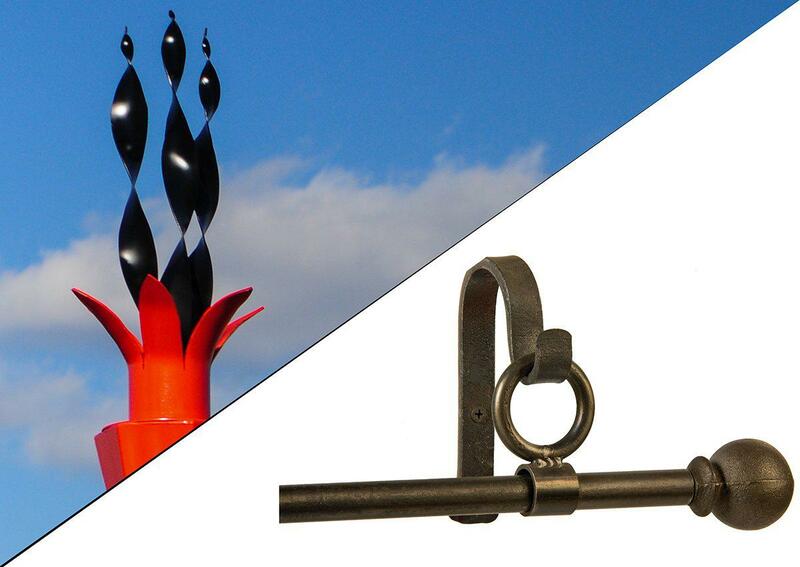 The gesture is ironwork designed as a part of a larger endeavor. It is one of many ingredients used by the designer to create their vision of a beautiful and inviting home. This is the ironwork I have included in this web site. The reason for this split is a practical one. While I still view ironwork as a huge, unexplored frontier, the designers use my gestures to create their visions, much as a poet would string together different words, or a band leader would meld the sounds of hundreds of players. This web site is an orderly and hopefully easy to use selection of gestures they can use in the creation of their masterpiece. One similarity between the gesture and the statement is how we approach it from the shop. Statements are just that. Designed and built to convey. And we try to make every step in their creation reflect that. Gestures get the same thorough attention. While we design and build a variety of gestures to give the designers more tools to create with, our goal is not simply to supply ironwork, but to support the designer through the process. We want to be that invisible hand that makes it look simple and effortless.